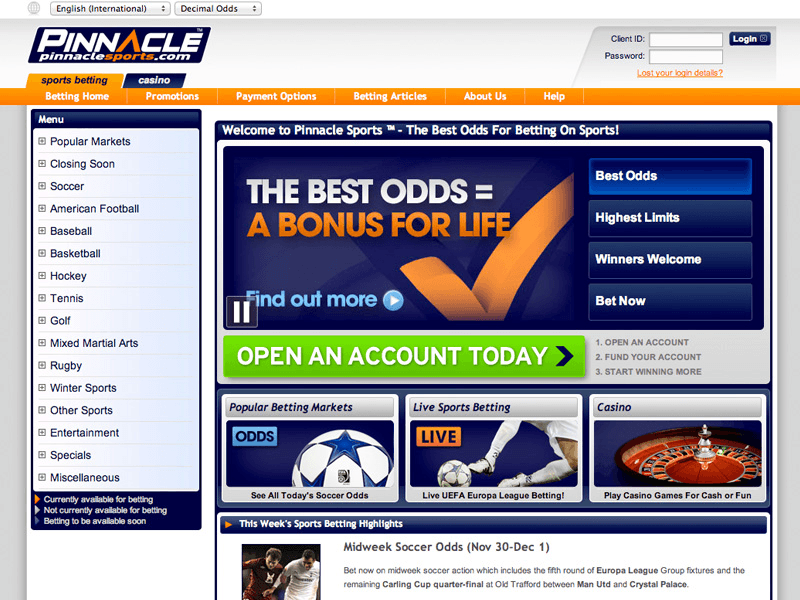 Pinnacle Sports is an online sports betting site located in Curacao. Today, Pinnacle truly does live up to its name by being one of the leading players in the wagering industry, with customers from more than 100 different countries worldwide. Pinnacle has one of the biggest markets in the online gambling industry and really does strive to cater to as many people as possible. BONUS INTRODUCTION – There's currently no sign-up bonus with Pinnacle, but instead win from the fair odds of the game! Operating under licenses from Curacao and Malta, Pinnacle Sports is a high volume sportsbook, bt even that volume has its limitations. Bettors from the United States, United Kingdom and Spain are prohibited from wagering with Pinnacle. If bonuses and promotions are what you look for when you choose your gambling site, then Pinnacle is one to avoid. Pinnacle does not offer a sign-up bonus or any bonuses at all for that matter. The site offers other advantages to try offset their non-existant bonus scheme. The help section of Pinnacle provides you with just about all the information you need, from payments, to account info, to explanations about the different wagering types. However, the biggest setback with Pinnacle is that you have rather limited ways to contact customer support when you don't find your answer. The only method available is email. Emails, however, are returned promptly. Pinnacle serves customers from all around the world, so it's no surprise how many payment methods are available. On Pinnacle, you can obtain your payout from a choice of 20 different currencies, a number most sites simply cannot match. The payout methods the site offers will vary depending on the currency you use, but there are nineteen different options. Most payouts come with a fee between $15 to $30. Pinnacle is really in tune with its worldwide customer base. As such, the site offers 17 different language choices. Many other sportsbooks don't have anywhere near as many options to choose from. Want to become a more skilful bettor? Pinnacle provides you with up-to-date sports news and tips on various different casino games. Pinnacle also wants to educate its clients. Check out the site's betting articles to learn more and improve your betting experience. Pinnacle might not offer any bonuses, but it almost makes up for it by giving bettors excellent betting lines on the sportsbook. Some sites offer betting lines with some unusually competitive odds, which may be suitable for more experienced gamblers.However, for the more novice bettor, it is generally a safer option to go with less-competitive ones Pinnacle regularly offers. Their odds are also very clearly marked on the home page. Also, Pinnacle has a "closing soon" tab, which advises prospective bettors how long they have left to place their wager. Pinnacle offers live betting options on all of the major North American sports and expands its portfolio to European soccer, too. Some sites don't offer live betting, and of those that do, it's definitely not the way Pinnacle does. They make the process user friendly, which adds excitement to the sport you're wagering on. There's no hassle so you can place your undivided attention on the game at hand. At any given moment, you are bound to find at least a half dozen different sports or leagues on which Pinnacle is taking live in-game wagers. Pinnacle has no shortage of betting options for its customers to choose from. The site has betting lines for just about every game and sport that bettors are most likely to follow, including live bets. Pinnacle also offers specials on a regular basis, which includes many team futures. Beyond the major sports, you will also find odds offered on cycling, boxing, esports, MMA, tennis, handball, rugby, snooker, table tennis Aussie rules and volleyball. There are also always a wide array of special offers on tap at Pinnacle in a variety of sports to add a little flavor and spice to your wagering. As much as Pinnacle comes with a wide range of choices of payouts options, the site comes with equally as many deposit methods. Deposits on Pinnacle also work in 20 different currencies. Some currencies work with more deposit methods than others, all of which have different price ranges. The vast majority of options are free of fees, which all customers should be happy about. Afterall, who in their right mind likes fees? Like its live betting platform, Pinnacle's mobile site is easy to access and user friendly. No matter where you are or what your are doing, you can get your action in play. Forgot to put down that wager on the Spain-Colombia friendly you so wanted to bet on? Not to worry. Access Pinnacle's mobile site at https://www.pinnacle.com/m/ from your mobile device and you are instantly in to win. When it comes to banking, Pinnacle arguably has more currency options to choose from than any of its competitors. Few other sites can match the 17 different languages sports bettors enthusiasts can use to enjoy their betting experience. The biggest downside with using Pinnacle is that there are no bonuses available. The Pinnacle casio offers unlimited 0.3 cash back on any casino game excluding Craps and Blackjack RNG. Your cashback gets automatically credited to your account after each bet and can be withdrawn at any time without restriction. In the Pinnacle live casino, you can play and interact with live dealers.